It's the only way to ensure full food protection. Just getting to know our hilarious yet ferocious Marta Beast? You'll find lots more photos of her here and here. Her puppy pics are here. © FarmgirlFare.com, the totally devoted to our job foodie farm blog where three-year-old Marta, who is such a sweetheart—and does actually know how to smile—has some of the biggest paws I've ever seen. They're huge. Back in 1991, when I was an early 20's California girl dreaming and scheming about moving to rural New England (which was the plan before life intervened and I ended up adventuring sight unseen to Missouri instead), I asked a friend who was working at a bookstore to order me a copy of a book called Maine Farm: A Year of Country Life by Stanley Joseph and his photographer wife, Lynn Karlin. I knew nothing about it except that it had a nice title. The book, which is available from amazon.com for under $5, turned out to be a large square hardcover that is part farm journal, part how-to manual, and part beautiful coffee table book. It covers a year on Stanley and Lynn's 22-acre Penobscot Bay farm, which was previously owned by back-to-the-land icons and authors Scott and Helen Nearing and is located down the road from Eliot Coleman and Barbara Damrosch's Four Season Farm. Have a tip top weekend! © FarmgirlFare.com, the artfully perched, sweet toothed foodie farm blog where I've been on a dessert baking spree lately, and I think next up will be some Baby Chocolate Chip and Toffee Shortbread Cookies. Mixing up a batch of these cute little treats is almost as easy as eating those addicting toffee pieces straight from the bag—not that I would ever do something like that. At least not when anyone's looking. Fortunately the sheep and donkeys don't mind dog germs on their breakfast. Love longears? On February 6th I started posting a new donkey photo every day! I call it The Daily Donkey, and you'll find them all corralled behind The Daily Donkey navigation tab up at the top of the page. © FarmgirlFare.com, the rough housing foodie farm blog where when these two aren't moleing or patrolling (Beagle Bert is out in the hayfield working on his Junior Guard Dog Badge as I type), they're rolling. Wednesday Dose of Cute: Time to Eat? © FarmgirlFare.com, the blowdried foodie farm blog where I don't know how I managed to get along before I nabbed a pile of flour sack towels at the dollar store a couple years ago. I reach for them constantly—and some of them are even still white! Sunday Dose of Cute: One, Two. . .
Bird and nature fans throughout North America are invited to take part in the 14th annual Great Backyard Bird Count, which runs from Friday, February 18th through Monday, February 21st. This four-day event is a joint project between The Cornell Lab of Ornithology, the National Audubon Society, and Bird Studies Canada (BSC) that engages bird watchers in counting birds to create a real-time snapshot of where the birds are across the continent. 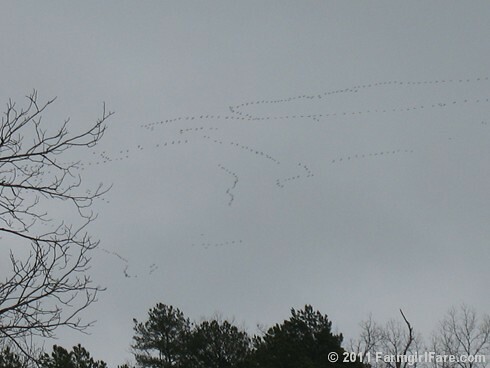 Anyone can participate in the Great Backyard Bird Count, from novice bird watchers to experts. It's a great opportunity for families, students, and people of all ages to discover the wonders of nature in backyards, schoolyards, and local parks while making an important contribution to conservation. And Mr. Midnight (who is purring his head off on my lap as I type this) has been taking full advantage of it. © FarmgirlFare.com, the 74 degree (which feels very strange in February!) foodie farm blog where one of the nice things about living in a falling down shack is that when the cats decide to make their own pet door out of a window—and then 'decorate' the wall while going in and out—you don't have to freak out or panic, you just get to laugh and enjoy watching them use it. © FarmgirlFare.com, the up before the sun foodie farm blog where today's early morning 40 mile trip to the vet's office for a spay and neuter extravaganza went off without a hitch (Beagle Bert's peeing all over my leg while sitting on my lap in the truck totally doesn't count), and when I called to check on Daisy and Bert at 5:00 this afternoon, they were both doing fine—especially since we were able to put them in a kennel run together this morning (along with Bert's security blanket and sock). Thanks for the well wishes. We're all really looking forward to having those two safe and sound and back on the farm tomorrow. 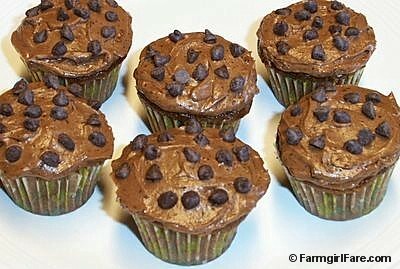 And these Easy Chocolate Babycakes with Mocha Buttercream Frosting, made from my simple Emergency Chocolate Cake batter, are a sweet little treat that's sure to be a big hit. 2/14/09: You Know I Love to Use Sheep Manure in the Garden, but. . . The Daily Donkey 9: Just a little kiss? © FarmgirlFare.com, the lovey dovey foodie farm blog where our hearts are always warm no matter what the weather. Sunday Dose of Cute: One of those Times. . . When you get out the camera instead of saying Get Out. Cluck, cluck, cluck! You'll find flocks of chicken photos here and here and here. The Daily Donkey 8: Garlic scape treats, anyone? © FarmgirlFare.com the sticking your nose where it doesn't belong foodie farm blog where if you're gonna do something bad, you'd better make it good—or at least cute. Cute will get you out of so much trouble around here it's ridiculous. 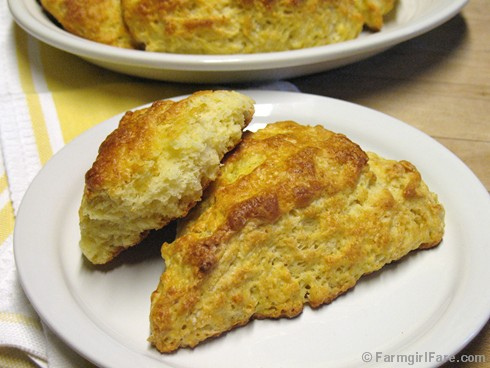 These oversized scones are crunchy on the outside, moist and tender inside. In my previous California life, before I moved to the wilds of Missouri and became an enthusiastic but clueless farmgirl, I owned a little bakery cafe. I also bought and sold antiques (in order to fund my collecting habit), so I decorated the place in the 1920s-1950s vintage style I love. There were 1940s floral print cloths on the little round tables, pretty mismatched old platters displaying goodies in the curved glass pastry case, thick white china mugs for serving the locally roasted coffee, and a variety of cheerful handmade vintage aprons tied around my waist. I served the kind of comforting, made from scratch treats I'm always hoping to find when I walk into a bakery: giant chocolate chip cookies, chunky oatmeal walnut raisin cookies, buttery little pecan tarts, big squares of carrot cake with lots of cream cheese frosting, savory ham and sharp cheddar muffins made with a dollop of brown mustard, devil's food cake with chocolate buttercream, spicy pumpkin muffins, apple pie with streusel topping, hunks of old-fashioned sour cream pecan coffeecake. I acquired a following of loyal British ex-pats who adored my 'traditional' currant scones, and I took it as a compliment when people would come in looking for "the little old grandmother we heard bakes everything in the back." Um, that would be 24-year-old me. Nothing stays the same on a farm, and yet there are some things that never change. From year to year, we find a comforting rhythm: little lambs in early spring, juicy heirloom tomatoes in summer, beautiful color in fall, feeding hay in winter, and most of our snow in February. The storms just keep coming. At least today's three inches of snow covered up all the treacherous ice. Don't get me wrong; I really do love winter. This photo is from one year ago today (when our beloved wet weather creek was running), but it could have easily been taken this afternoon—except for the lack of blood. © FarmgirlFare.com, the rattletrap foodie farm blog where, despite pouring a bunch of money into it last spring, this big old temperamental tractor still doesn't want to run. We did get the little diesel tractor (another antique) back in shape, but it's too small to pull the baler—which means we need to find ourselves another tractor soon, because before we know it, it'll be time to get back in the hay. Ack. Sunday Dose of Cute: Coming at You—The Daily Donkey! What do you end up with when you have a herd of seven donkeys and a longear loving blogger who carries her camera everywhere? A lot of extra donkey photos. And since I know many of you are longear lovers, too, I came up with an idea for a new Farmgirl Fare feature that I think is going to be a lot of fun. I'm calling it The Daily Donkey. The idea is simple—which is why I'm pretty confident that it actually is going to be daily. Each day I will post one random, previously unpublished donkey photo from the files I've been amassing over the years. It might have been taken last week, or it might have been from back in 2007. I'll tell you who it is and when it was taken. No clever captions, no newsy copyright notices, just down and dirty donkey cuteness. Every single day. Stay close to your food dish. . .
Lots more photos tomorrow. In the meantime, Happy Groundhog Day! Ours was indeed a happy one, which had nothing to do with seeing shadows, and everything to do with the fact that there was thankfully no sign of Joe's furry little arch enemy, Chucky. We haven't seen him in years, although today Joe pointed out that if Chucky did happen to still be lurking around on the farm somewhere, he was probably snowed or iced in to his burrow today and wouldn't be coming out to check the weather at all. The high was only about 20 degrees, and that sharp wind was something fierce. The sun did pop out for a few glistening minutes late this afternoon before disappearing below the ridge, though. Just long enough to snap some beautiful shots. © FarmgirlFare.com, the no sign of melting foodie farm blog where we didn't get nearly as much snow as predicted last night (which is just fine by us), but oh my gosh is it cold out there. Before Joe could finish scooping the chunks of broken ice out of the 100-gallon stock tanks in Donkeyland this morning (while I supervised), it was already freezing back up again.